What does it mean to be an Official Ticketing Partner? Here you can find your official tickets to see your team go for victory against the opponent of your choice. And remember that if there are no more tickets, you can always search Our Official Marketplace! We'd like to introduce you to our Marketplace, the platform at your disposal, so you can both buy or sell your tickets/season pass, in the event you can't support Xolos yourself. Don't leave a seat empty! 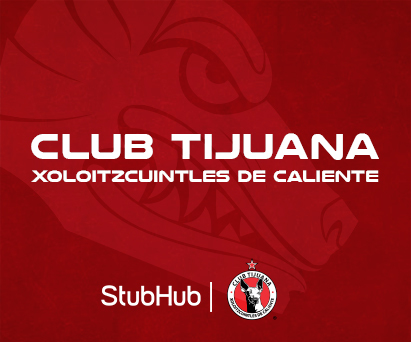 What's better than publishing your tickets here, and letting another Xolos fan support the team for you!. How can you sell your Xolopass? Choose the match that you want to list your Xolopass for. Select the number of season passes you want to sell. Select the format: E-tickets. This is because once your tickets arrive to be purchased by a buyer, a digital E-ticket is automatically generated, which can be sent to the buyer. In location: Select the zone, block, row and seat. It's very important to fill in all of the fields, so your season pass can be located and a PDF can be sent to the buyer. IMPORTANT: Select the Upload later. Choose the price that wish you to sell your pass for. Finish the sale of your pass and your done. You only have to wait until your Xolopass is sold. If I sell my pass, what do I do next? Our customer service team will contact and inform you with the following steps you'll need to take to sell your Xolopass. You have nothing to worry about! Once the sale of your season pass is confirmed, a digital e-ticket will be automatically generated for each ticket sold, as such it isn't necessary to manage the shipping and delivery of your season pass. Want to see the Womens' Xolos team? Do it here!